These lines were adapted from what I wrote during my silent retreat this winter. I thought they would be appropriate to share on Passion Sunday since each of the sorrowful mysteries of the rosary are included in the Passion account. From the cross, everything is loved. We come to you today because we are on a common journey. Place yourself, patron of pilgrims, at the head of our pilgrimage. Teach us, apostle and friend of the Lord, the WAY which leads to him. Open us, preacher of the Gospel, to the TRUTH you learned from your Master’s lips. 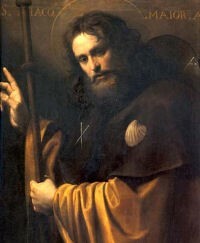 And so we end the Letter of St. James with a plea for patience and conversion. We get one final glimpse into the concrete life of the community. We see that they have institutionalized healing in a ritual of anointing and prayer for the sick by the elders of the church. They have also developed some form of mutual confession and prayer for forgiveness (Reading the New Testament, p. 299). Perhaps these sacramental moments of grace helped heal the divisions among them? Do they for us? James has come increasingly to be regarded as a book of the church: it depicts the practical like of a community where people pray for each other and confess their sins to one another, and where people are committed to social ministry on behalf of those in distress. It is a community where the suffering and the cheerful gather for prayer and praise, a place where diseases are healed, sins are forgiven, and souls are saved from death. The community is composed of people who love the Lord and who are committed to loving their neighbors. But they are also sinners, people who struggle with temptation and sometimes yield to partiality, pride and worldly cravings. The letter echoes the Didache, an early Christian writing, which said, “If you can bear the entire yoke of the Lord, you will be perfect; but if you cannot, do as much as you can.” (Powell, Introducing the New Testament, p. 460-461) What better can we do as church? How might these teachings help you this Lent? find peace? My brother just turned 49 this week so you can see that we are only 15 months apart. And two boys being fifteen months apart presents many opportunities for competition. Subconsciously, I think we divided the world between us so there was not too much conflict. John focused on football, baseball and girls and I focused on basketball and academics. It has been 30 years and I still do not know who got the best of that deal. Where do wars come from? We still ask this question. James seems to think it has something to do with our passions and putting too much focus on this world instead of the next. Oscar Romero, Archbishop of San Salvador who was martyred for standing up for the poor, echoes the same sentiment. In a homily broadcasted throughout El Salvador, he said, “The commitment to be a Christian is this: to follow Christ in the incarnation. If Christ is the majestic God who becomes human, humble unto a slave’s death on a cross, and lives (now) with the poor, so should be our Christian faith. Christ invites us not to fear persecution because, you must believe my friends, those who commit themselves to the poor have to accept the same destiny as the poor. And in El Salvador, we know what the destiny of the poor is: to be captured, to be tortured, to reappear as corpses.” We must be one with the poor, not stuck in our own way of doing things in our little worlds. If we ignore the suffering, it is a social sin. We must draw near to God and listen to how God wants us to serve. Romero later said, “As a pastor, I am obliged, by divine command, to give my life for those whom I love – and that is all Salvadorans, even those who may assassinate me…They will be wasting their time. A bishop will die, but the Church of God, which is the people, will never perish…If I am killed, I will rise again in the Salvadoran people.” Wow-that is following Christ in the incarnation. What does this wake up in you? James stresses that Christianity requires a sweeping and pervasive change in our lives which are totally caught up in God. The contrast is clear: God is Lord, not we (Collegeville Bible Commentary, p. 61). This is metanoia, turning around, to live with a new heart in a new spirit. How do we do this? Prayer. “A heart sensitive to God is born in prayer and is nurtured by prayerful attention to the presence of God in the diverse experiences of living. A heart so sensitive is alert to the diverse ways of God and can read the signs of God’s presence and action in the world. Without this prayerful attentiveness to God, moral reflection stops short of attending to the fullness of the relationships which make up the moral life,” (Reason Informed by Faith, Gula, p. 15). It may be largely because of James that many theologians now speak not only of orthodoxy (right thinking, correct dogma) but also of orthopraxis (right practice, correct behavior), and specifically of the orthopraxis of the church as a whole in a way that transcends concerns for personal morality…This letter of James has also been prized by various peace movements for its keen insight into the reasons for conflict, war, and strife (Introducing the New Testament, Powell, p. 459-460). Gossip. We often do it because we want to belong. This longing to be on the inside is such a pull. It is a desire that nags at us, like food stuck in our teeth. “Desire makes us act and when we act what we do will either lead to a greater integration or disintegration within our personalities, minds , and bodies – and to the strengthening or deterioration of our relationship to God, others and the cosmic world,” (Rolheiser,The Holy Longing, p. 7). The desire to be on the inside, through our words, shapes who we are. This affects the world around us, and our relationship with God. How reasonable is it for me to believe in the truth of what I say? If what we are talking about is truthful, life-giving and with good intention, then the gossip may be considered good. Another rule of thumb is whether you would say it to the person’s face if present. Odds are that the talk is safe. “Who among you loves life, take delight in prosperous days? Keep your tongue from evil, your lips from speaking lies. Turn from evil and do good; seek peace and pursue it,” (Psalm 34: 13-15). James talks about acting one way but feeling the opposite. Can you identify? Being double-minded is not having a singleness of purpose. It is as if we are at war with ourselves. We cannot serve two masters. Jesus tells us, “No one can serve two masters; for either he will hate the one and love the other, or he will be devoted to one and despise the other,” (Matthew 6:24). Soren Kierkegaard reflected on this idea. He said, “If it is possible that a man can will only one thing then he must will the good,” (A Kierkegaard Anthology, p. 271). This is a singularity of thought. This is living authentically. It is not living with two masters. It is behaving as true to ourselves as we are able. Yet even when we fail, we can turn back again. Kierkegaard continues in hope, “For as the Good is only a single thing, so all ways lead to the Good, even the false ones – when the repentant one follows the same way back…let your heart in truth will only one thing, for therein is the heart’s purity,” (p. 272). Even when we choose wrong, we can follow our way back to the good. Then he ends: And the fruit of righteousness is sown in peace for those who cultivate peace. What does this mean to you? How are these themes reflected in the documentary, Walking the Camino? How might these teachings help you find peace? But the more I saw it, the more I thought about it. 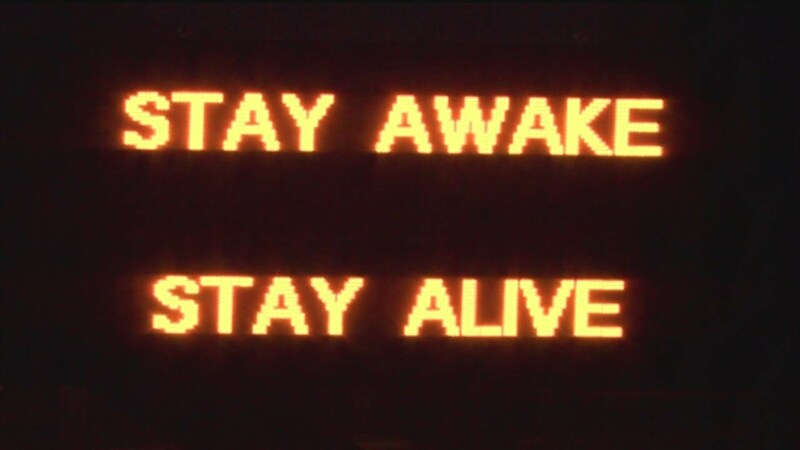 This is like Lent: Stay awake, stay alive. I haven’t been very motivated this Lent. I think I might be a Lenten fail. Sure, I’m going to Mass, abstaining on Fridays and I even went to a Penance Service. But life has been busy and chaotic, as I’m sure you probably relate. Life is on a day-to-day basis, getting things done. Check. Most of my prayers have had a “Help me!” theme. I tried to give up worrying for Lent but gave up. Now I’m worrying about worrying. Not exactly what God had in mind, I think. So I ask myself: What is Lent supposed to be like for me this year? Cuz so far, this ain’t it. The Jesuit in me thinks this sign might have something to do with it. Stay awake. Stay awake to God. All God wants is to be close to me, to all of us. God reaches out to us many times throughout the day, whether we notice or not. We are never absent from God, unless we turn away from God ourselves. I can’t seem to find the author, but I have a prayer I say often that goes, ” My beloved and generous God, I repent of all my sins of blindness to your daily thousand-and-one visits and all the countless gifts you send my way.” Stay awake to the hope, love and surprises God has in store. This can only be good. Pay attention (and I’m mainly talking to me but cool beans if it helps you too) to the blessedness in life. It’s there. And it’s life-giving. Stay alive to it. I get caught up in the check lists and getting things done, but there is beauty in the lost moments. Even concentrating too much on the chatter in my head closes me off to the reality of God revealing Godself in the day. Stay alive to the possibility that God might show up. Whether I like it or not, God just may know better than I do. Life is not supposed to be a game we have already figured out on our own; it’s just meant to be played. Stay alive to the idea that God is ever present. It’s why Jesus came to live with us. He died so we could stay alive to what God has in store for us: life in abundance! Scripture scholars tell us that Abraham’s near sacrifice of Isaac was an important moment in the history of Judaism. It was taken for a sign that contrary to the religions that surrounded them, their God would not demand human sacrifice. That is well and good, but we are left with the terrible details of what might be the most harrowing tale in the Hebrew Scriptures. A community meeting is described where 2 clients come to the elders for a judgment (1 Co 6:1-6). James attacks the favoritism that is naturally shown to successful and influential people, arguing that such is wrong. In a different context Paul insisted on God’s lack of favoritism, both in judgment (Rom 2:11) and in election (Rom 3:22; 10:12); this impartiality destroyed the privileged position of the Jews as God’s favorites and led to a radical sense of egalitarianism in the Pauline churches (see Gal 3:28). This is probably the basis for James’ attack on favoritism here: God’s impartiality to us and our equal status in the church. How does faith/love of God show itself practically in our lives? (Collegeville Bible Commentary, p. 52-53). James seems to differ from Paul in his theology of faith and works. James says they go hand in hand, where Paul says we are saved by faith alone. In Romans 4:3, Paul describes Abraham as being righteous whether he did good works or not. In James 2:21, he says how Abraham was active in his faith and works, that his faith was completed by the works. For Paul, God is the one who accepts us unconditionally, and when we allow him to do this (faith! ), then we live in a new world and we are new persons. Faith is the acceptance of our new status: that of being real human beings in the presence of the real God. Faith is the act of accepting freedom. This freedom is, first of all, freedom from the “law of works.” From the need to force acceptance from God through our meritorious works. But the freedom in question is also freedom from sin and death…we are called to accept as gifts from his hands whatever good works or achievements are the inevitable results when we allow him to accept us unconditionally, (Dwyer, J. The Word Was Made Flesh, p. 111-112). Of course the “works” which James demands Christians perform – providing charity for the poor brother or sister – are not the “works” of Judaizing by Gentiles against which Paul was arguing. Some interpreters think that just as Paul had to counter sloganizing among the Corinthians, so James is dealing with a sloganizing about faith which may have originated in popular reports of Pauline teaching, (Perkins, P. Reading the New Testament, p. 298). Most theologians agree that there is no real argument here. Paul and James appear to be talking past each other, using words such as justification, works and faith to mean different things. James may be responding not to Paul but rather to a misunderstanding of Paul. In any case, perhaps his words should be read on their own merit, (Powell, M. Introducing the New Testament, p. 455). Spend some time in prayer mulling over where you stand in the argument for faith vs. works.